I know I'm a day late, but I really wanted to participate. 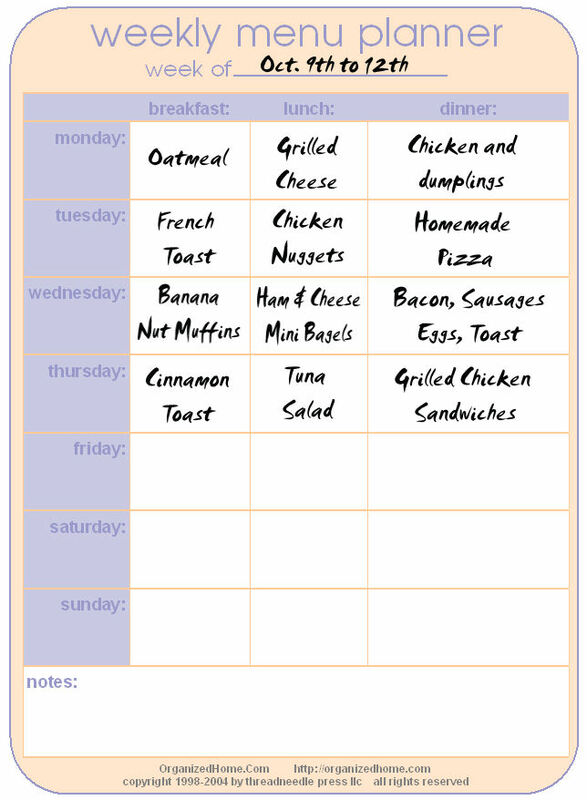 Been having some muscle pains lately and haven't been on the computer much, that is the reason for this late addition to Laura's "Menu Plan Monday". I will post the recipes as I make them. A couple of you asked for the recipe, so I'm going to share it with you. 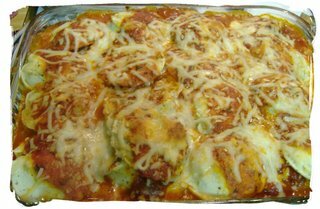 What I love about this dish is that it's just like lasagna but instead of using the lasagna noodles AND cheese, you already have that in the Cheese Ravioli...cuts down on time and prep, which when you're a mom you KNOW is a precious thing. I serve this meal with some Garlic Cheese Bread and a simple salad. I 10 inch skillet combine spaghetti sauce and 1/3 cup water, bring to boiling. Stir in ravioli, cover, cook over medium heat about 5 min or till ravioli are nearly tender, stirring once. 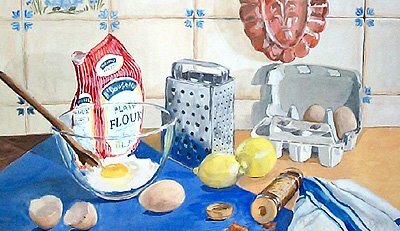 Stir together the egg, ricotta cheese, and romano or parmesan cheese. Dot ravioli with spinach. Spon ricotta mixture atop. Cover and cook over low heat about 10 min more. or till ricotta layer is set and pasta is just tender. One meal that I make quite often is this one. 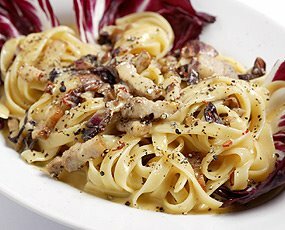 A few years ago when money was really tight, it was one of those dishes that I could throw together with the ingredients I had on hand. This recipe that I'm sharing is from the Better Homes and Garden "New Cookbook Special Edition" and slightly different than my version. Cook bacon until crisp. Drain. Cook pasta according to package directions. Drain; keep warm. Meanwhile, for sauce, in a saucepan combine egg, half and half, and butter. Cook and stir over medium heat until egg mixture just coats a metal spoon (about 6 minutes); do not boil. Immediately pour sauce over pasta; stir gently to coat. Add cooked bacon, Parmesan cheese and parsley; stir gently to combine. Season with with pepper. Serve immediately. Mother Dearest from the great blog "Home Sweet Home" asked me if I had a recipe for homemade frosting. 1. In a bowl, beat together the butter, whipping cream and vanilla until smooth (about 3 minutes). 2. Add in icing sugar; beat very well until smooth, adding more if necessary to achieve desired consistency. 3. Note: In order for the icing to have a creamy texture, only whipping cream must be used. In medium bowl, beat butter. 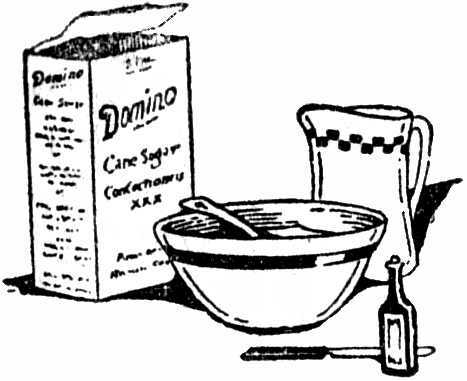 Add confectioners' sugar and cocoa alternately with milk, beating to spreading consistency (additional milk may be needed). Stir in vanilla. Those are just a few of the recipes I've used before, and when I want to make a chocolate frosting I just add cocoa to the ingredients. Enjoy!!! 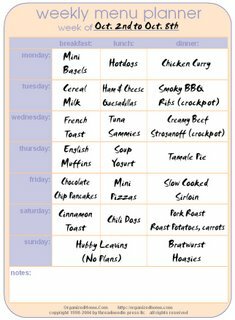 Morning ladies, it's monday and you know that means it's time to take out our menus and then go share them over at Laura's Blog. 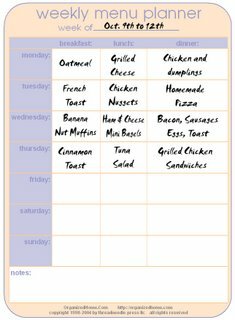 Even if you don't have a menu to share, I encourage you to go over and take a look at all the wonderful meals being made across blogland, who knows, you might be inspired to use one of the meals for your own menus this week. 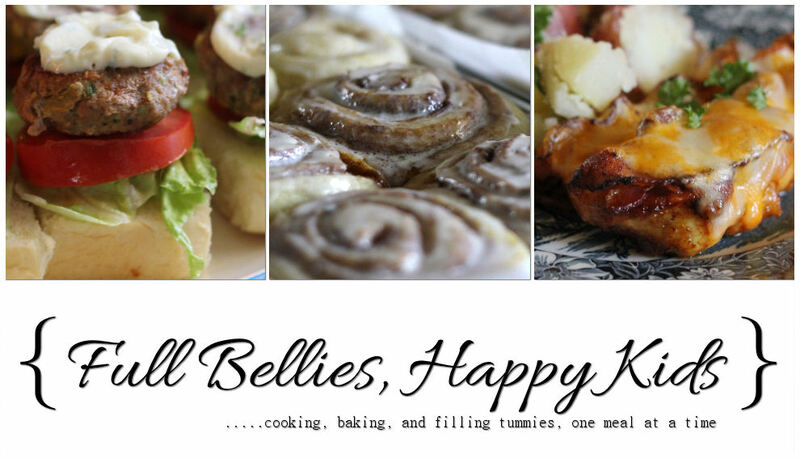 As always, I will share the recipes on the same day that I'm making them. 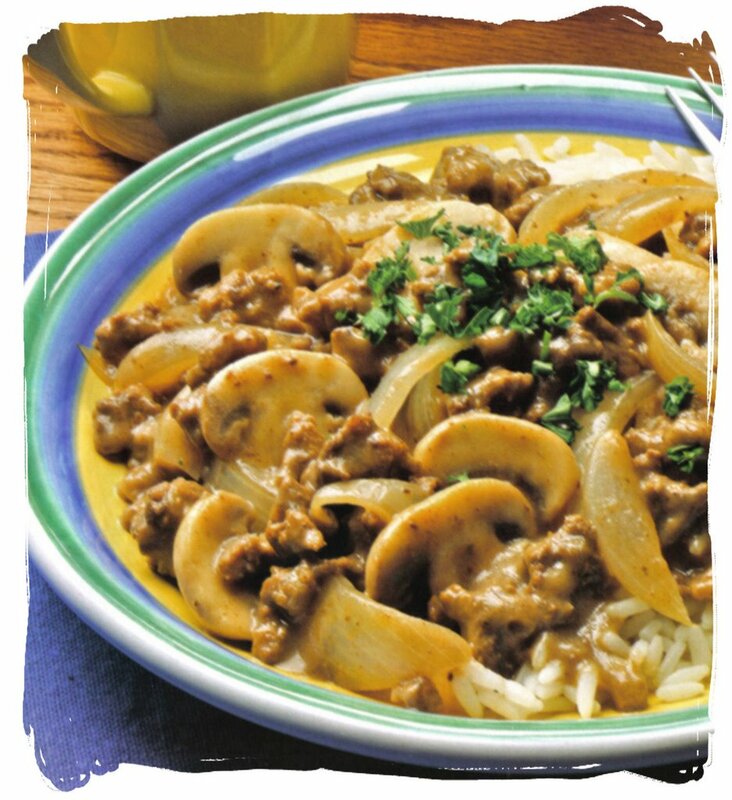 In a large skillet cook ground meat, mushrooms, onion, and garlic until meat is brown and onion is tender. Drain off fat. In a medium bowl stir together beef gravy, sour cream, Worcestershire sauce, thyme and pepper. Stir sour cream mixture into meat mixture. Cook and stir until heated through. Serve the meat mixture over hot cooked rice. Sprinkle with parsley. The name itself makes me salivate, so when I first saw this recipe on a Rachael Ray show, I knew I had to try it. It's so easy to make but so good, and it looks like you've been in the kitchen all day long, which I LOVE because I can spend time with the family and then within a few minutes have this wonderful meal put together. Preheat a Dutch oven over medium-high heat. Add a couple tablespoons of EVOO, 2 turns of the pan. Season chicken liberally with salt and pepper, and add to the hot oil, skin side down. Brown chicken, about 5 minutes per side. Remove and reserve. Add another 2 turns of the pan of EVOO, the onions, thyme, honey and the garlic. Season the onions with salt and pepper, and cook, stirring frequently for about 20-30 minutes or until the onions are really brown. 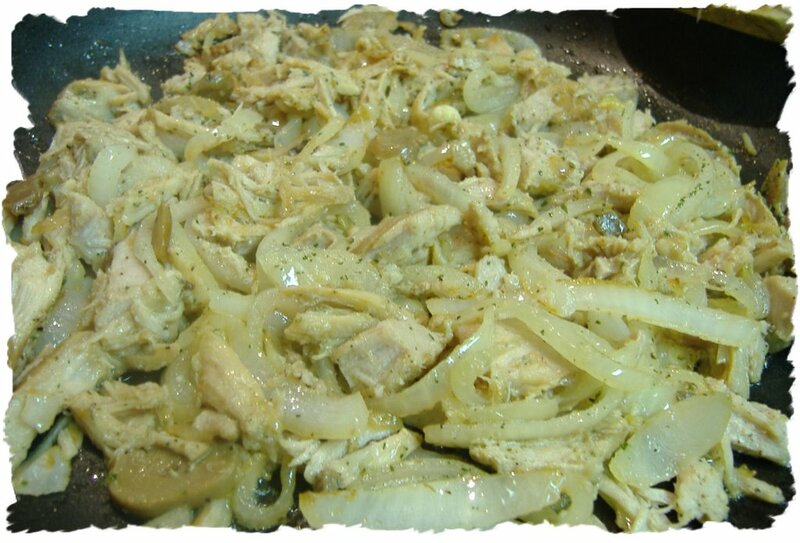 Once at a simmer, return the chicken to the pot with the liquid and onions. Place a lid on the pot, turn the heat down to medium and simmer for about 15 minutes, flipping the chicken over in the sauce about halfway through. Remove lid, check to make sure the chicken is cooked through by cutting a small slit in the thickest part of the breast with a paring knife to have a look inside. If it is cooked through, no pink meat, remove to a plate and cover with foil to keep warm. Turn the heat up to high and simmer until the sauce thickens up slightly, about 4-5 minutes. You can serve the chicken right away topped with a big spoon full of sauce and the onions or you can return the chicken to the pot, turn the heat off and cover with the lid until you're ready to serve it. Once you are ready, add 1/2-3/4 cup additional chicken stock and turn the heat back on to heat everything back up. Serve with mashed potatoes and a salad. 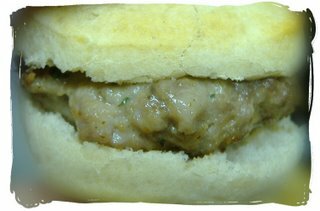 One thing my husband loves are sausage biscuits, so I knew I wanted to come up with a homemade version that was quick and tasty. I had leftover ground meat from Portuguese Meatballs and I thought it would be perfect. I gave it a try and it was a huge hit, it made great Sausage Biscuits. For the meat filling, follow the recipe for the Portuguese Meatballs. 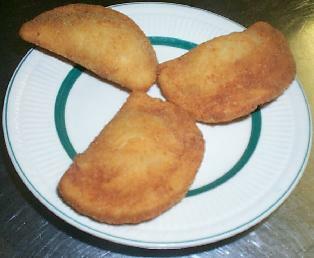 Shape into round small flat patties, and fry them until done. For the biscuits I used a can of buttermilk biscuits that I had on hand, serve warm. They are SO good, and you can also add a slice of cheese or egg if you wish, though we prefer them plain. I remember my greatgrandmother and grandmother making these quite often, I loved them and they're so versatile that you can use them for hamburgers too. What makes it so tasty is the ingredients that go into seasoning your ground meat. It can be beef or pork, and turkey would be tasty too. In a bowl, mix all ingredients together just until well blended. Cover with plastic wrap and place in refrigerator overnight or for a few hours. 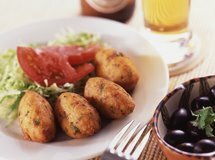 Shape into balls, dip in egg and roll in breadcrumbs. Fry on medium heat for a few minutes on each side until brown. Remove to a plate covered with paper towels to drain the grease. Serve with homemade fries and a salad. Shape into hamburger patties and grill until done. Serve on warm hamburger buns, with lettuce, tomato and onion slices. 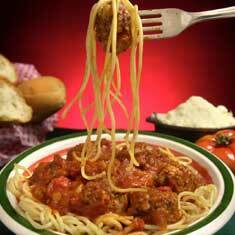 The Ultimate Spaghetti and Meatball Supper! 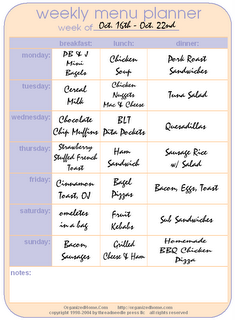 This is a recipe that I got from Rachael Ray, it's so easy to make and really really good. Hubby and the kids LOVE spaghetti and what's better than some meatballs too huh??? Will also give me a chance to try out my new Spaghetti Bowl set. Add EVOO to a medium saucepan over moderate heat. Add the onions and half of the chopped garlic, and cook until soft, about 5 minutes. Stir in the crushed tomatoes and tomato sauce. Season the sauce with salt and pepper. Let simmer for 8-10 minutes. While the sauce is simmering, make the meatballs. Place the ground veal and pork in a medium mixing bowl and add the remaining chopped garlic, parsley, egg, bread crumbs, 1/2 cup Parmigiano cheese, salt and pepper. After thoroughly combining everything with your hands, roll the mixture into balls the size of a large walnut and drop into the simmering sauce. While the meatballs are simmering in the sauce, add the beef bouillon cubes and bay leaf to the boiling water for the pasta. Once the cubes are dissolved, add the spaghetti. Cook to al dente. Right before draining the pasta, reserve a ladle of pasta water for the sauce. Once the meatballs are cooked through, add the reserved starchy beefy pasta water and the butter to the sauce. Drain the spaghetti, discard the bay leaf and transfer to a large serving bowl. Top with the sauce and the remaining 1/4 cup grated Parmigiano. Pass more grated cheese at the table. This is one that brings back childhood memories too, and memories of Christmas with all the family around the table. I LOVE this custard, actually the word love doesn't even describe it, it's just sooooo decadent. If you've never tried it, you just have to, and it makes a great dessert for when you have company over. Go ahead and try it and let me know what you think!!! I always make it for Christmas Eve, it's part of the Portuguese Tradition. Melt 1/3 cup sugar in a heavy saucepan over medium-low heat until it turns golden brown. 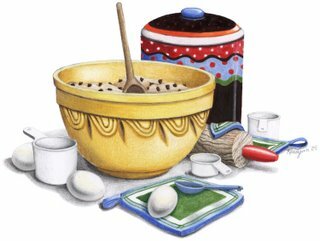 Carefully pour the caramel into a 1-1/2-quart casserole dish or divide it among eight individual ramekins (or custard cups) and set aside. Bring a kettle of water to a boil and preheat oven to 350°. Meanwhile, in a mixing bowl, beat eggs and sugar with an electric mixer until pale yellow. Stir in salt, milk, and lemon zest; mix well. 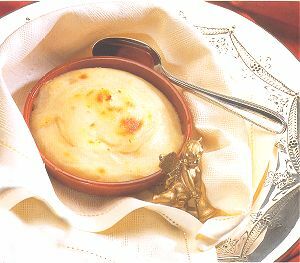 Pour the mixture into casserole dish or divide among ramekins. Next, pour boiling water into a 2-quart (or larger) baking dish. Set casserole dish or ramekins into this larger pan and place in the oven. Bake 50 to 55 minutes at 350°, until centers no longer jiggle when tapped. Let cool. 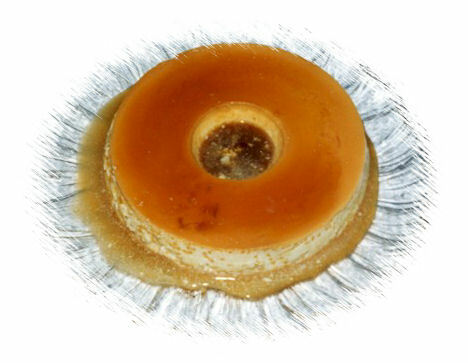 To serve, invert pan on a plate and let the carmelized sugar sauce ooze over the flan. I always make mine in one big dish, but a lot of people will do the individual ramekins. The reason I make mine an individual big one is that I find it's easier for when you have company over, that way I don't have to worry about making enough or having to make 2 or 3 etc. 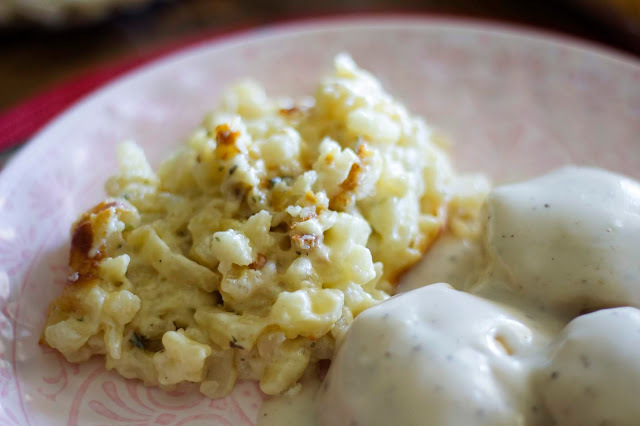 "This melt in your mouth recipe from my grandmother has been in my family since 1899." What is better than ginger anything during the Fall season??? It's rainy here today and dark and cold and I always love being in the kitchen cooking or baking with the kids. 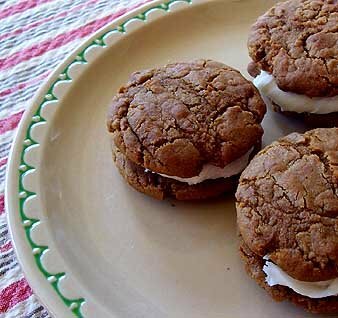 I wanted to bake cookies this afternoon, and I was trying to think of a good recipe that included either pumpkin or molasses or ginger......and then I remembered that a while ago, Vicki from "Turkey Feathers" had posted about these great Gingersnap cookies. I knew I had to try them, so I followed her link to the recipe. 1. Preheat oven to 350 degrees F (275 degrees C). 2. Mix and sift the first 5 ingredients. Sift a second time and place the mixture back into the sifter. 3. Beat the shortening until creamy. Add the 1 cup of sugar gradually and continue beating. Beat in the egg and the molasses. 4. Sift into this about 1/3 of the flour mixture, stirring and blending well. Repeat until all is added. Roll the dough into tiny balls by hand, rolling each in a mixture of cinnamon and sugar. 5. Place 2 inches apart on a ungreased baking sheet. Bake 10 minutes until the tops are rounded and slightly cracked. Cool on a wire rack. Store in an air tight container. 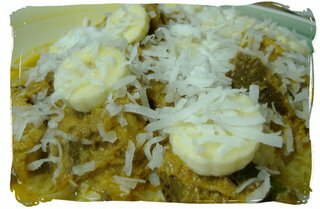 Now this is one recipe that I remember from my childhood. When I was going to school in Portugal, I had afternoon classes, so every day my greatgrandmother would make us lunch, which was always yummy stuff. This rice dish was by far one of my favorites, it was good but also filling. It's one that I make nowadays and my kids enjoy. In a pan over medium heat, add oil, bay leaf, garlic, salt and pepper, tomato sauce and onion. 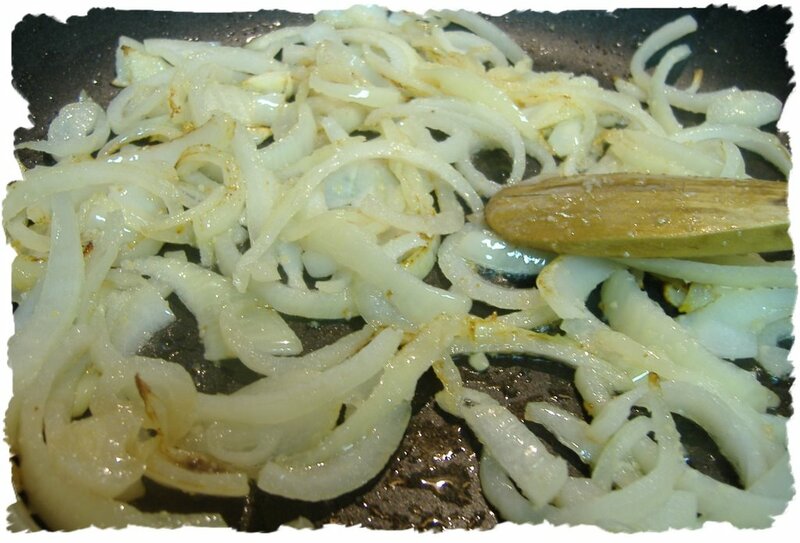 Cook for about 2 to 3 minutes or until onion is tender....add the sausage and cook for another 5 to 6 minutes. Add the rice and the water to the pan, reduce the heat to low and cook for about 20 minutes or until rice is done. I usually check often to make sure that there is still enough water or if needed I add just a little more, I want the rice to be cooked but I also want a bit of the sauce to stay, so I don't want it completely dried up. Remove the bay leaf and serve, along with a salad or some veggies. 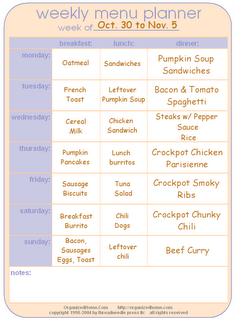 This week's menu is simple because hubby is still gone until Sunday. 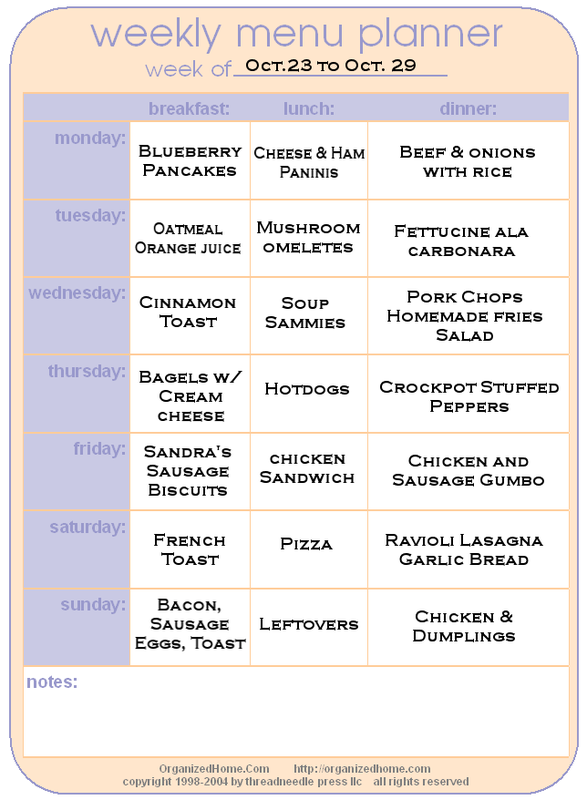 The kids have enjoyed all these Breakfasts for Dinner and their favorite meals, me on the other hand, enjoyed it but I'm more than ready to start cooking again.....I miss my stove!!!! 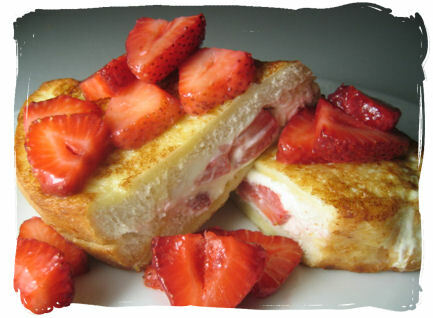 I'm going to post the recipe for the Strawberry Stuffed French Toast. It's one that my family loves and it's super easy to make. Mix cream cheese, jam and nuts. Cut Italian or French bread into diagonal pieces about 1 inch thick. Cut pocket in each slice. Stuff with mixture. Dip into batter, coating both sides. With skillet on medium heat, brown both sides in margarine. RED LOBSTER CHEDDAR BAY BISCUITS!!! Heat oven to 450 degrees. Mix Bisquick, milk and cheese until a soft dough forms. Drop by spoonfuls onto an ungreased cooking sheet. Bake 8- 10 min until golden brown. Mix butter and garlic powder. Brush mixture over warm biscuits before removing from cookie sheet. 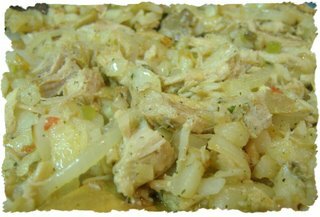 This next dish is also great for leftovers, and you can use meat or chicken, even fish, it's just delicious with either one. It's a great filling meal because it includes scrambled eggs. In a large skillet add about 2 to 3 tablespoons of olive oil. Add the garlic and cook over low heat until it starts to brown. Remove garlic and add the fries. Cook fries until done, and lightly browned, remove with a spatula to a dish and set aside. On the same oil, fry the onions until tender, remove them to a dish and set aside too, next put in the leftover meat and cook until warmed through. Remove skillet from heat and add the fries and the onions. Mix everything well. In a separate bowl, mix the eggs until well blended, add salt and pepper to taste, and then add the eggs to the skillet. Return to the heat and stir constantly until the eggs are done (they should look like scrambled eggs), incorporating all the ingredients. Remove from heat and garnish with parsley. Serve immediately. The translation of the name of this dish, is one that usually makes people go "WHAT?!?!?! ", because it means "Old Clothes". Yeah, Old Clothes, but really don't be afraid of the name because it has nothing to do with the wonderful taste. 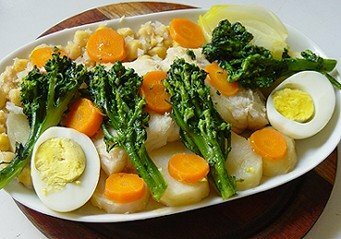 It's nothing extravagant or difficult to make, it's pretty simple and the dish is usually about using leftover meats and veggies from a previous meal, though a lot of people use it for the leftover Christmas Meal, which means codfish, potatoes, cauliflower etc. 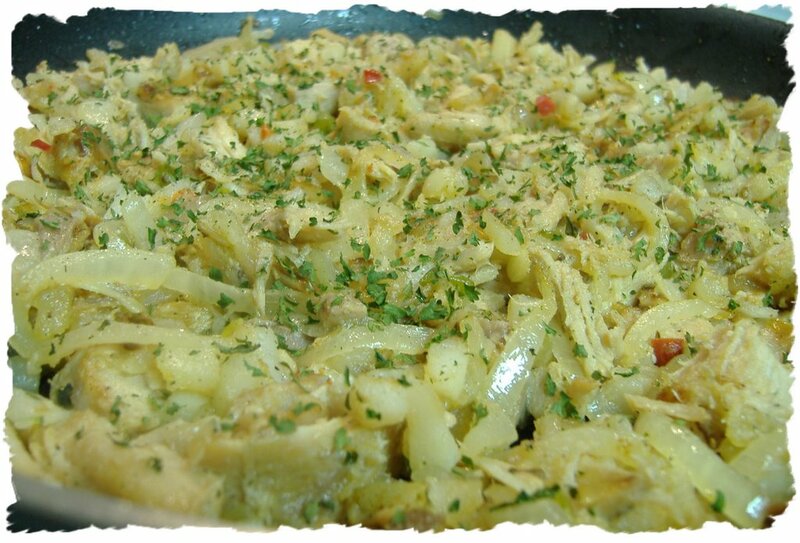 In a large skillet pour 3 tablespoons of olive oil and tons of finely chopped garlic. Now if you don't like that much garlic, just use one clove, finely chopped....my family and I LOVE garlic so I use a lot. Next you add one large onion, finely sliced. 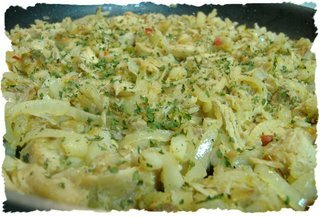 Toss together with the garlic and olive oil, then add the leftover meat, shredded or cut into bite size chunks..
Add potatoes or leftover veggies and stir together over medium heat until it's warmed through. A great idea is to use some Potatoes O' Brien. I always have them on hand, and when the leftovers didn't have any veggies, I add about a half a package of the Pototoes, it's great because they already have peppers included. 1. Melt butter in a large saucepan or pot over medium heat. Saute onion and garlic for 5 minutes, then stir in chicken and saute until browned, about 7 to 10 minutes. Stir in broth, vegetables, sage and thyme; mix all together and let simmer over medium heat while preparing the dumplings. 2. In a medium bowl, mix flour and parsley together. Add shortening and stir mixture into a coarse, mealy dough. Stir in buttermilk, a little bit at a time, until dough holds together and is soft but firm. (If needed, add up to 2 tablespoons more buttermilk). 3. Bring chicken mixture to a boil over medium high heat and drop round spoonfuls of dumpling mixture on top (do not let dumplings touch each other). Reduce heat to low, cover pot and let simmer for 10 to 12 minutes. 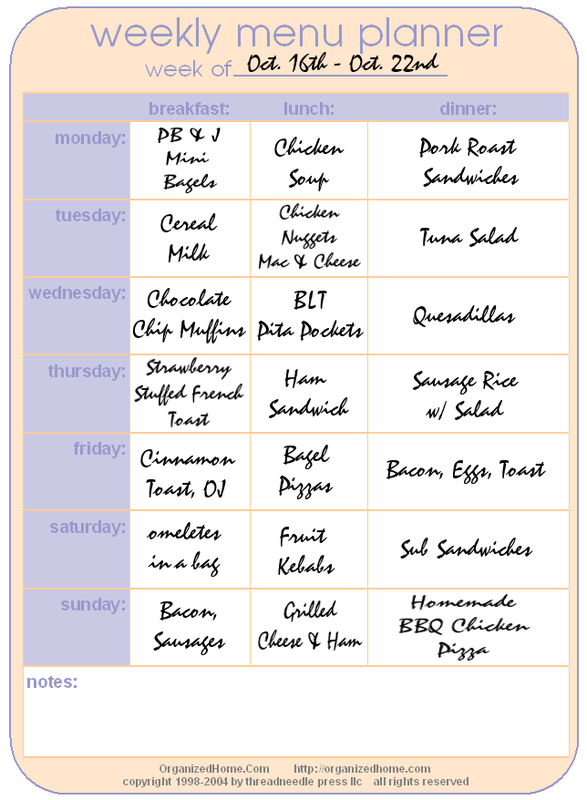 Alright ladies, it's time for another Menu Plan Monday, thank you Laura for hosting this every monday :) I just love knowing what others are cooking, and I usually get really good ideas for my own menus!!! 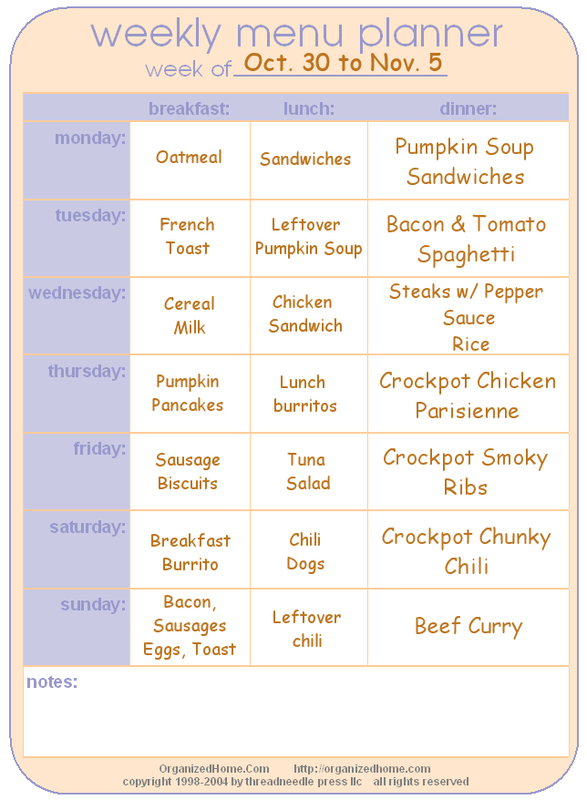 So I wish I could thrill you all with some GREAT menu for this week, but when hubby goes TDY somewhere, it's just me and the kids and honestly, I'm not going to cook big meals because the kids just don't want to eat. A little nibble here and there and that's it. Enjoy!!! I know I'm going to!!! This is what we're having for dinner tonight, it's already cooking away in the slow cooker and it smells heavenly. Oh btw, the other day someone asked if I was going to share the recipe for the Smoky Flavored Barbecue Ribs, and since I posted it under my Slow Cooking Thursday post, just click here for it. As always I will come back and post the pictures after it's ready to eat. In a large nonstick skillet coated with nonstic cooking spray, brown beef on both sides. Place onion and green pepper in a 3-qt. slow cooker. Top with beef. Combine the broth, Worcestershire sauce, dill, thyme, pepper and pper flakes; pour over beef. Cover and cook on high for 3-4 hours or until meat reaches desired doneness and vegetables are crisp-tender. Remove beef and keep warm. Combine cornstarch and water until smooth; gradually stir into cooking juices. Cover and cook about 30 minutes longer or until slightly thickened. Return beef to the slow cooker; heat through. I came upon this recipe online and just couldn't pass it up. 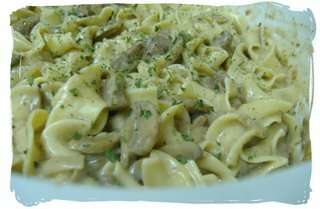 I LOVE Beef Stroganoff but never fix it in the crockpot, so being able to find a quicker and easier way to make it, is just a plus for me. Trim all excess fat from steak and cut meat into 3 inch strips about 1/2 inch wide. Combine 1/2 cup flour, the salt, pepper and dry mustard; toss with steak strips to coat thoroughly. Place coated steak strips in crock pot; stir in onion rings and mushrooms. Add beef broth and wine; stir well. Cover and cook on low setting for 8-10 hours. Before serving, combine sour cream with 1/4 cup flour; stir into crock pot. 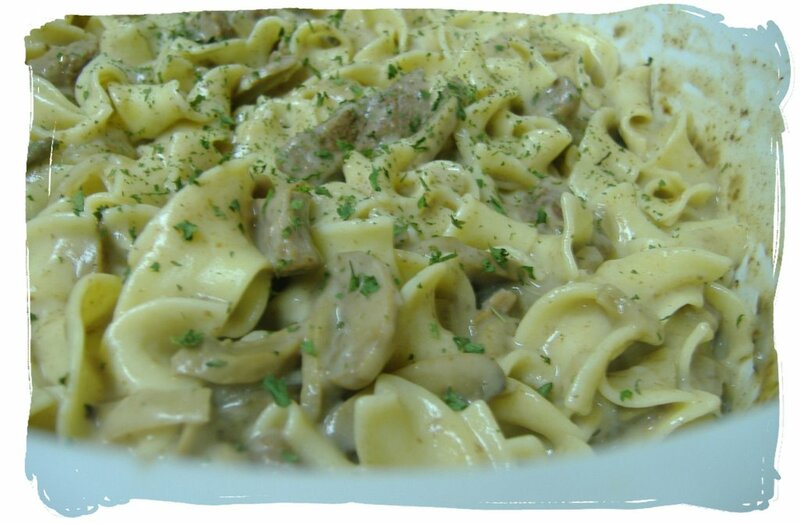 Serve stroganoff over rice or noodles. Tonight's dinner is per hubby's request. A few weeks back I decided to serve my curry the way I'm used to eating it back home. 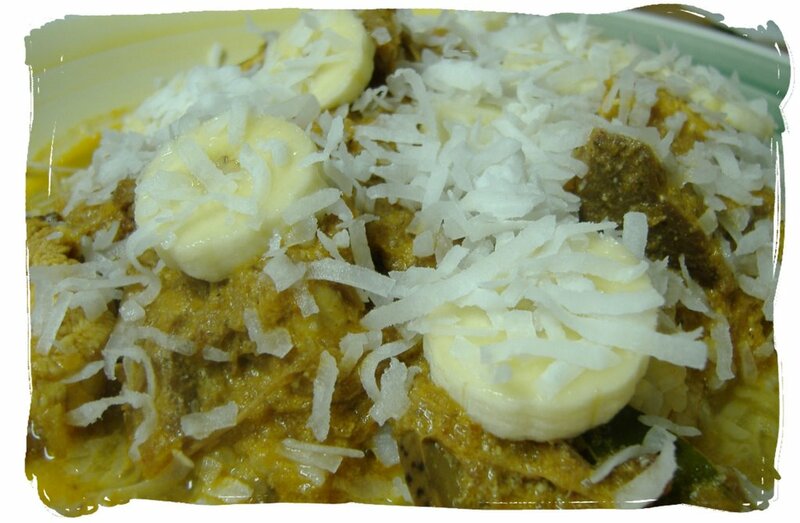 So I'm linking you to the recipe, because it's been posted before as Beef Curry. I use the same base recipe but change the main ingredient, either beef, chicken, shrimp or crab are just wonderful. You want to be sure you have a good curry powder, mine actually comes from South Africa. 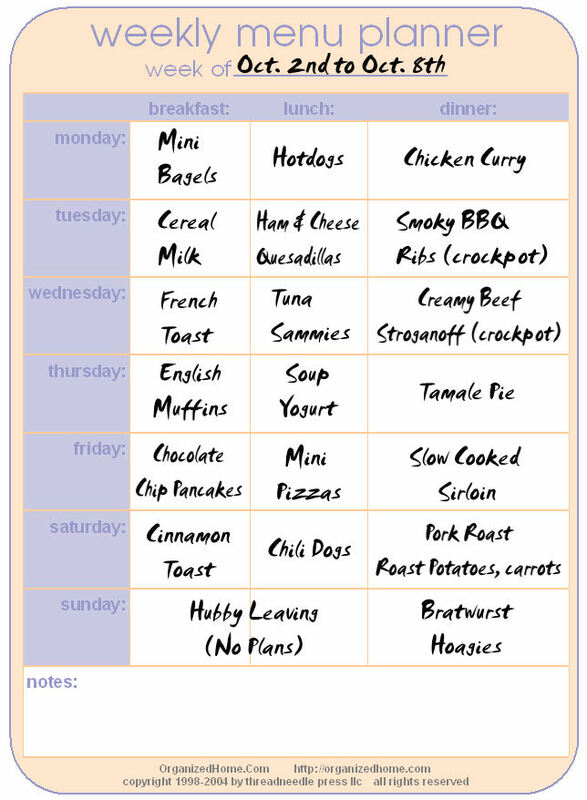 The wonderful lady over at "Overwhelmed with Joy" is hosting this great recipe exchange today. I'm sure you're familiar with her weekly "Five Ingredients Friday" feature, so this is just another way to add to your recipe collection. 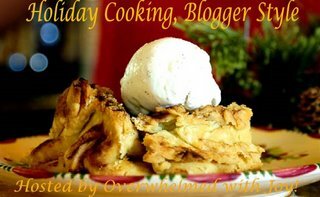 As the holiday season draws near, I thought it might be fun to host a holiday specific recipe exchange called Holiday Cooking, Blogger Style! Don't worry, these don't have to be just 5 ingredients they can be as long as you'd like. I don't mind the extra time and effort in the kitchen during the holidays, I just ask that they are tried and true recipes. As most of you know, I'm portuguese. We have traditions and ways of doing things, and of course we have our recipes for the Holidays. The traditional Christmas meal in Portugal is eaten during the evening of Christmas Eve and consists of codfish with vegetables and boiled potatoes. This is normally followed by shellfish, wild meats or other expensive foods. Every house has a rich table set in the living room full with traditional food, cakes, fried cookies, nuts and other goodies! The traditional Xmas cake is "Bolo Rei" (meaning King Cake) which is placed in the center of the table. 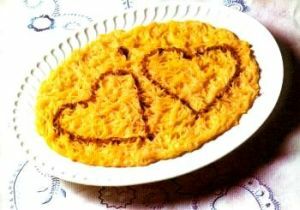 People drink porto wine, traditional liquors and eat 'azevias' and 'filhozes' (Portuguese biscuits and sweets). The party lasts until the early hours of the morning! On Christmas Day the living room table remains untouched and people still enjoy their goodies together! Families come together and have Christmas Day lunch together. With that in mind, I wanted to share a few recipes for some of the foods you will find on the Christmas table. Prepare yourselves, they're not only good, but dangerous (can't eat just one). For the Pastry, boil one cup of water with the margarine and a little bit of salt, to taste. When the water starts boiling, add the cup of flour, mixing well until it forms a ball and pulls away from the sides. Remove from the pan and turn onto a lightly floured surface. Knead briefly until dough is smooth and slightly springs back when pressed with fingers. Just don't overwork the dough. Divide the dough into two balls, cover with a dish towel and set aside until it cools down. For the Filling, in one tbsp of butter, fry the onion. Add one tablespoon of flour and a little bit of water. Add the salt and chilli flakes to taste. Add the shrimp and mix well. I usually go in and add some garlic and paprika or just make sure it has enough salt and pepper. When the dough is cool, take half the dough and roll out to 1/8-inch thickness. Using a cutter that is 3 1/2 to 4 inches in diameter (smaller if making appetizers for a party), cut round circles of dough. Dip them in beaten egg and then breadcrumbs and then fry them in about 2 to 3 inches of oil, until golden brown. Remove and set on paper towels to drain. 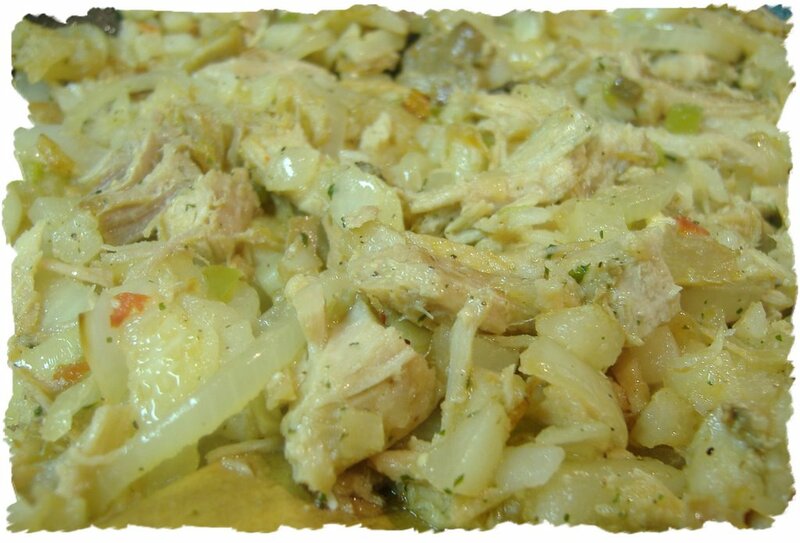 You can also try using Chicken, Tuna or even Codfish in place of the shrimp. These are really really good, and yes they take a bit of time to make, but well worth the effort. 1. Cod must be soaked (re-hydrated) in water for 24 hours. 2. Boil potatoes (add salt to water if desired) and cod fish. 3. Once cooked and while cod is cooling, mash the potatoes. 4. Once cod is cool peel off skin and tear into small pieces. 6. 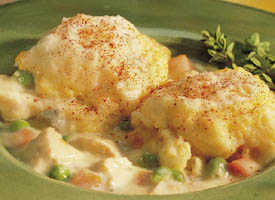 Once cod is “mashed” into small pieces add to mashed potatoes. 7. Add chopped onion, parsley, pepper, onion and eggs. 9. Add baking powder and wheat four and mix well. 1. Heat oil in frying pan, (or deep fryer) once hot, dip two tablespoons into oil. 2. Then grab the mixture in one spoon and shape with other into ovals. 3. Place into frying pan with hot oil. 4. Once it is a golden colour, remove and place on and cover with paper towel to soak up oil. 5. Repeat procedure until all mixture is done. Mix the flour with a few spoonfuls of milk, set aside, pour the remaining milk into a saucepan, add the lemon zest and cinnamon stick. Heat over a low flame, stirring with a wooden spoon, remove from the heat once the milk is very hot, let cool to lukewarm. In a bowl, beat the egg yolks until light and frothy, add to the warm milk, return the saucepan to the heat and remove once the mixture is hot. Add the flour-milk mixture, return to the heat and let thicken, stirring constantly. Remove the lemon zest and cinnamon stick, pour into an oval baking dish, let cool until the custard forms a thin skin on top, sprinkle with 100 g (7 tbsp.) sugar. 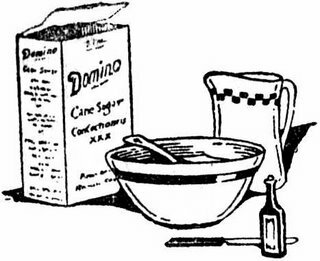 Optional: heat the base of a cast-iron disk or flat iron over a high flame until white hot and apply it to the sugar for a few seconds to caramelize the sugar on the custard, or sprinkle with cinnamon in a geometric pattern. In a sauce pot, bring the water and lemon rind to a boil. Add pasta; cook until water is absorbed. Add the milk and sugar; bring to a boil. Lower heat and cook, stirring constantly, for 10 minutes. In a bowl, beat yolks; add a little of the hot milk mixture. Stirring constantly, slowly add egg mixture to the hot noodle mixture; cook over low heat for 5 to 10 minutes. Remove from heat and cool for 10 minutes. Pour into a serving dish. Sprinkle with cinnamon. Chill before serving. Makes 6 to 8 servings. 3. drain the eggs and shell them. 4. offer the chopped garlic, parsley and onion in separate little dishes. 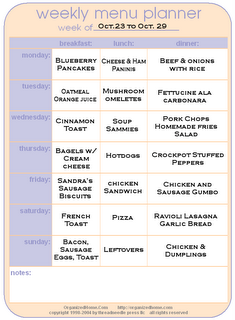 Well it's monday and that means "Time to pull out the menu's". Laura over at "I'm an Organizing Junkie" hosts this wonderful weekly meme, so if you're interested in playing along or checking out what everyone else is cooking, just go on over.